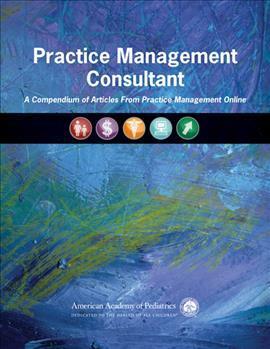 Practice Management Consultant-A Compendium of Articles from Practice Management Online covers a wide variety of issues that impact the daily management of pediatric practices. In many ways, pediatric practices are in a state of economic crisis in a rapidly changing healthcare environment. From vaccine payment and supply issues to competition from large-scale retail-based clinics, pediatric practices both large and small are facing many business issues and constraints. This essential practice reference includes key practice management resources and guidance. Contents Include: Getting Started/Practice Basics, Office Operations, Business Considerations and Contracts, Employment/Personnel, Finance and Payment, Medical Liability and Risk Management, Patient Management, Quality Improvement, Medical Home, Physician Health/Wellness, Career Transitions, Appendices and Forms, including Supplies Needed to Start a Practice, Sample Employee Handbook Outline, Staff Evaluations: Guidelines and Instructions, Staff Evaluations: Template, Sample Financial Policy, Patient Survey, Parental Refusal to Vaccinate Form, Local List of Possible Community Resources for Pediatric Practices, Sample Waiver or Advance Beneficiary Notice (ABN), Template Letter: Appeal to Payers for Payment, Template Letter: Unable to Continue Medical Care, Template Letter: Outstanding Patient Account Balance, Template Letter: Notification of Retirement or Closing a Practice, and more. The American Academy of Pediatrics (AAP) is an organization of 67,000 primary care pediatricians, pediatric medical subspecialists and pediatric surgical specialists dedicated to the health, safety and well-being of infants, children, adolescents and young adults. The AAP is the largest pediatric publisher in the world, with a diverse list of resources that includes essential clinical and practice management titles and award-winning books for parents.